Personally the ASOS, I cant really tell the difference & also prefer the belt!! Those shoes in Joseph one however... J'adore! I like the ASOS better. So feminine. wow, I love these from ASOS! GORG pants (haha in both!) but I'm def leaning towards the ASOS ones ;) Fab picks as always! Very cool. I'm going with ASOS. Oooo, I like the Asos ones better! I really like the cuff that the ASOS pants have, so I would go with those. Love the color....so strong and beautiful! I really like Joseph more! I actually like the Asos ones better! love ASOS' pair!! and yes i'm totally craving a splurge right now - but trying to be good. hehe. LOVE these! The color is amazing. The ASOS for sure!! And the blue color is divine! I think I may have to purchase a pair for my trip to Greece this summer! Im more of a jeans girl...which I need to go out shopping for soon! But I would love to be fun once in a while with bright pants like these! Great for summer! :) Happy day love! i actually think the asos ones look nicer, so i'd be a tightwad for sure! Loving these cropped pants! Going tightwad for these...can't argue with the price of the ASOS! Maybe the picture is better or maybe the Asos are really better but I am liking the more than the Joseph ones ..... plus, who needs 100% cotton? I can do fine with polyester, viscose, etc. I adore the cut and color. So perfect for summer. I have yet to shop at ASOS but now I am definitely heading over there to see their site. Love this cute marine blue find! It's hard to tell unless I saw it in person but from the photo, I actually like the ASOS version better! I love electric blue and from the photos, the ASOS ones actually look better. I'd probably have to see them in person though. From experience, I know that ASOS quality can be horrid and Joseph is incredible. I love the color of the pants. It's a lovely shade of blue. Coloured trousers are one of my favourite trends. This blue colour looks great. I love the ASOS ones: they look like they fit better. Such a great blue to have this summer. it's a pretty cool deal and glad that they come in various colors. i love ASOS but i like that the originals are made of 100% cotton! I think the thrifty finds are waaay cute! I definitely be cool with the ASOS pair--I actually like how they're styled a little better! Such a pretty color, too. I saw these on ASOS and felt a pang of sadness. When is one too old to wear slim coloured pants? I wish I knew! I love the pants from ASOS! Gwah! I both love and hate these pants! The color is so bright and awesome and I love the shape but my curvy legs would not fit in them! lol. great pick this week though! I love this idea and those crop pants. I've been crazy about blue lately and these are just one more thing on my wish list. wow, they are strikingly similar, so I would take the less expensive of the pair. I would love to find a great pair of bright blue colored jeans for the summer! I love these fun, bold pants! So chic. Asos rocks. How did I live without them? Love the ASOS one! I really love the color. Love this shade of blue (particularly the pocket-friendly version)! I really can't differentiate them if they're on the shelf side by side! 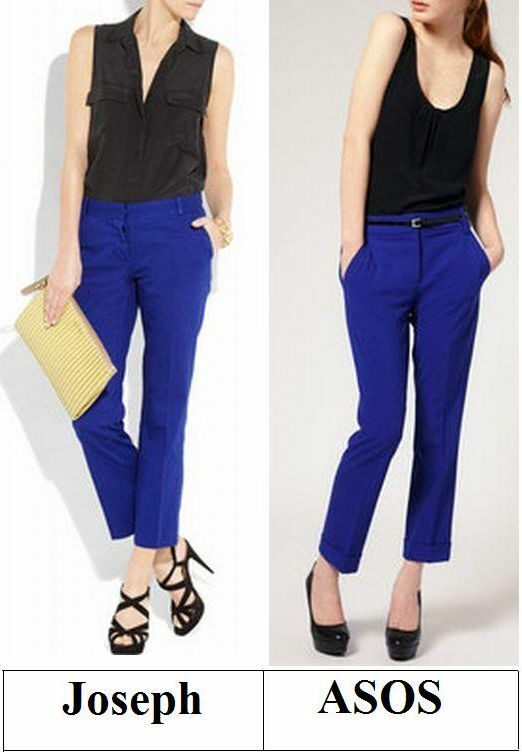 Loving the ASOS, plus the black top with the blue pants are super cute together.